/ Modified jun 15, 2018 1:04 p.m.
Attorney General Jeff Sessions after taking an oath of office, Feb. 9, 2017. WASHINGTON — Attorney General Jeff Sessions cited the Bible on Thursday in his defense of his border policy that is resulting in hundreds of immigrant children being separated from their parents after they enter the U.S. illegally. 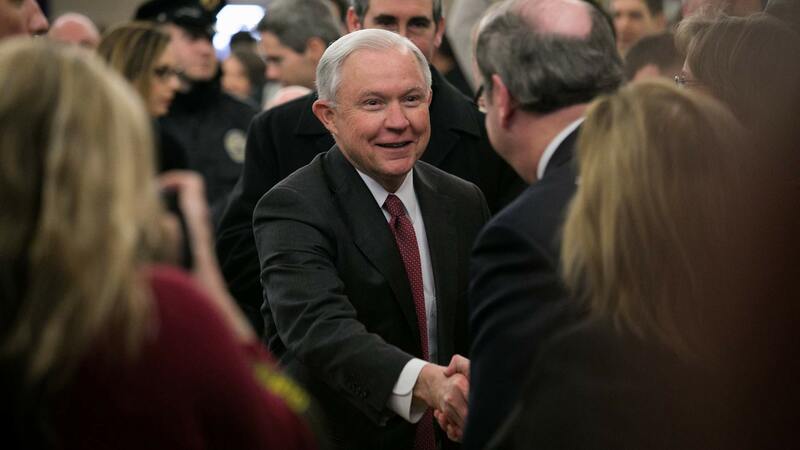 Sessions, speaking in Fort Wayne, Indiana, on immigration, pushed back against criticism he had received over the policy. On Wednesday, a cardinal in the Roman Catholic Church said that separating mothers from their babies was "immoral." Sessions said many of the recent criticisms were not "fair or logical and some are contrary to law." "I would cite you to the Apostle Paul and his clear and wise command in Romans 13, to obey the laws of the government because God has ordained them for the purpose of order," he said. "Orderly and lawful processes are good in themselves and protect the weak and lawful." Last month, the attorney general announced a "zero tolerance" policy that any adult who enters the country illegally is criminally prosecuted. U.S. protocol prohibits detaining children with their parents because the children are not charged with a crime and the parents are. According to U.S. Customs and Border Protection, more than 650 children were separated from their parents at the U.S.-Mexico border during a two-week period in May. White House press secretary Sarah Huckabee Sanders said Thursday that she hadn't seen Sessions' comments but affirmed that the Bible did back up the administration's actions. "I can say that it is very biblical to enforce the law. That is actually repeated a number of times throughout the Bible," she said. "It's a moral policy to follow and enforce the law." In an unusually tense series of exchanges in the White House briefing room, Sanders wrongly blamed Democrats for the policy separating children from parents and insisted the administration had made no changes in increasing the use. Until the policy was announced in April, such families were usually referred for civil deportation proceedings, not requiring separation. "The separation of illegal alien families is the product of the same legal loopholes that Democrats refuse to close, and these laws are the same that have been on the books for over a decade, and the president is simply enforcing them," she said. "We don't want this to be a problem," she said. Cardinal Daniel DiNardo, the archbishop of Galveston-Houston, told the U.S. Conference of Catholic Bishops on Wednesday that he was joining other religious leaders in opposing the government's border policy. "Our government has the discretion in our laws to ensure that young children are not separated from their parents and exposed to irreparable harm and trauma," DiNardo said in a statement.